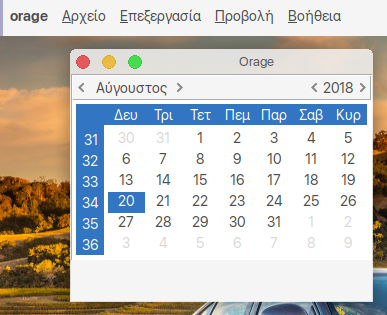 Using global app menu in xfce may be a little esoteric , appealling to those who whish a macos/unity , look and feel , so i just want to share the way i made it work for me , hoping it may be useful to anyone who wants to try it . Using top menu is not as simple as installing the plugin . Some extra work is needed and it took some searching to figure out. The solution i found comes from this page https://linuxdicasesuporte.blogspot.com ... xde-e.html . Step 1 . Install the plugin xfce4-topmenu-plugin , from synaptic with the necessary dependencies . Step 5. Log out -log in , and you're done . Am I happy with it ? Well yes and no . I am happy because it works , but it does not follow panel transparency , you need to have an opaque panel . Also the plugin developer mentions , in his page two more plugins , one for qt applications and one for Firefox , but i was not able to locate them in the repos or in debian package pages . @ Protokol Hi ! Sorry for late reply . Glad you could use it , sorry to hear it doesn't work anymore on MX-18. Since i'm , at the moment , doing a fresh MX install , i 'll have a look myself , and let you know if i find something new. Just curious...what's the advantage of topmenu over xfce-panel and whiskermenu or something as simple as Plank? They are different things. It is not an app launcher nor an alternative panel. It just a plugin for xfce4-panel to get the "menu bar" (file, edit, view, help, etc.) of an application shown on the panel itself instead of the traditional desktop way that places the menu bar inside the window of an application window -just under the window border of an application. What "advantages" could be on this configuration? Well, to save some vertical pixels on the screen, if you have a small display, may be. Sometimes I miss this feature on xfce, when working with "tiled" windows on my notebook. But I feel it more as a design concept, which you may find comfortable or not. I like it. I liked it when I used Ubuntu-Unity. Please check xfce4-appmenu-plugin from the MX Test Repo . It seems to be based on vala-appmenu (but i could be wrong). Plus it seems to work out of the box with no need for any deep level configuring . I'm trying this (xfce4-appmenu-plugin) but I can't get the Menu items at the top. Do you know if compiz causes issues with this package? I am running compiz also. @MAYBL8 Hi! This plugin seems to be more like a "pseudo" mac menu plugin , and less of a global menu implementation . It seems , somewhat similar in behavior to xfce4-windowck-plugin. I tested mine in a bit of a hurry , using the xfwm window manager , with the same results you mention , so i don't think it has anything to do with compiz . I haven't tested every package I have but LibreOffice for whatever reason shows its menu at the top. They mention installation of the xfce4-vala-appmenu-plugin from the website repo. Love to hear if this works, I may also switch to a Global menu having migrated from Ubuntu which also had that feature a few yrs back.